So … I’ve lost my tagline temporarily … because what I do from now on will no longer be ‘art textiles from the Isle of Tiree’ – though Tiree will always be a huge part of my heart and I’m sure will echo into my work for a long while yet. But here I am, on the mainland, in Swansea, South Wales, in a new place and a rented home, rootless. Alan is Welsh, of course, but I’m a mixture of Scottish, Irish and Cumbrian – though I have learned that Cumbria is known as Yr Hen Ogledd (the Old North) of Wales. It’s been a strange year, with so much uncertainty, decision-making, absence, then packing and the logistics – and emotions – of leaving a ten-year home and going into a furnished rental. Some of my equipment and most of my materials and books are in Northumberland (where I’ll be spending some of my time as well – another story). But I have a loom or two here, an almost working wheel, and enough fibre and yarn to be going on with. And I went to the West Wales Wool Show yesterday and came back with some Llanwenog yarn and some fibre – locally raised Shetland and overdyed British Jacob in autumnal colours. Just as on Tiree, there are a lot of sheep in Wales, and some unique breeds that I’m looking forward to learning about. Newly made rolags blended with several colours of dyed Jacob fibre from Ewe Spinning Me a Yarn, ‘bramble’ coloured Merino/Zwartbles blend from John Arbon‘s ‘Harvest Hues’ range and some little bits of silk and locks from my treasure trove. I’ll be making more of these and taking them to Northumberland where my working wheel is living just now; I can’t wait to be spinning again. Love love the colours. So have you blended these ready for spinning? Thank you, Sue – I am getting very autumnal! Yes, for spinning, they’re made on a blending board, which has tines like hard carders but is bigger and flat, so you can lay down the fibres for about three or four rolags at the same time. I change the colours a little each time I fill the board, then when I spin there are more variations through the yarn. Hi Fiona – Just came across your blog, I’m new to weaving (just bought a small Ashford) but not to fibre. I live on a croft in Shetland and keep my own small flock of Shetland sheep. 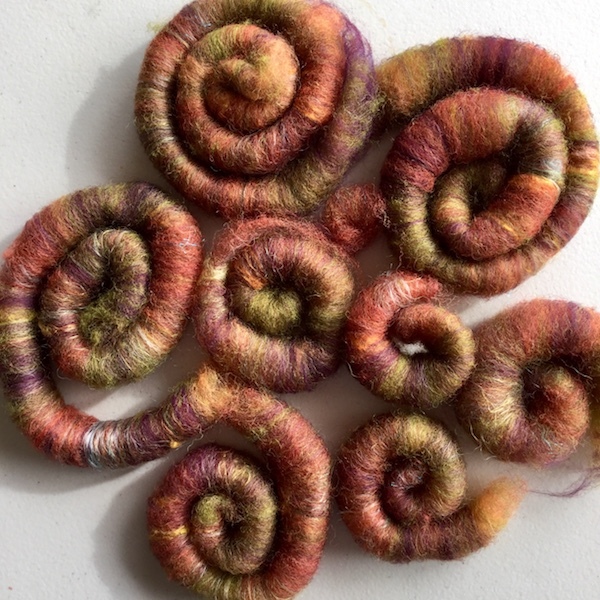 I’ve been dyeing and spinning art yarn mostly for years but get a bit disillusioned that art yarn isnt really appreciated. I hear ‘its lovely but what can I do with it’ a lot. Then I came across some Saori weaving recently and I knew it was going to be my new direction -talk about smitten! Thanks so much for commenting. I haven’t been doing so much creatively since moving away from Scotland and it’s encouraging that even so my blog is still making people happy! I loved Shetland when I visited and hope to come back one day.